"Leave no loose ends," says the tagline for the latest Arnold Schwarzenegger action extravaganza, Sabotage. The line is in reference to the mystery at the heart of the film, but it's a line the writers should have taken to heart in their screenplay. While it's no grand revelation that a Schwarzenegger film is lacking in the writing department, it should be mentioned that Sabotage is the kind of film that prides itself on having both over-the-top, insane violence and a tightly wound, suspenseful story. It wholly delivers on just one of those aspects, but it's never a film that puts a black mark on Schwarzenegger's action career. On the contrary, he may just be succeeding in his action career resurgence where Stallone is stumbling. Read on! For one, Schwarzenegger has no problem playing to his weaknesses as much as he does his strengths. Last seen as an aging sheriff in The Last Stand, in Sabotage he plays the aging leader of an elite task force. Schwarzenegger plays John 'Breacher' Wharton, high-ranking skull-cracker in the DEA and a man who leads quite the eclectic but equally skull-cracking bunch. Those roles are filled by some serious talent from TV and film, but we'll get to that momentarily. Wharton is haunted by a tragedy in his past, one that flashbacks show us deals with the Mexican drug cartel. When we first see Wharton and his men - and woman - in action, they're taking down a cartel safe house, pumping the men full of bullets and turning the giant pile of cash in the basement to burnt ashes. But not before scuttling $10M or so away for themselves. As the tropes of a good mystery tell us, the money goes missing, and Wharton has to contend with whoever stole the money, a prying investigator, and the cartel hit squad who is apparently taking his team out one member at a bloody time. Sounds like a job for Schwarzenegger, doesn't it? And oddly enough, Sabotage doesn't need Schwarzenegger. I say that to mean with the ensemble cast working here and the gray-area nature of every character in the film, this is more than just a thrown-together vehicle for an aging action star. There's much more going on under the film's hood than surface-level violence, and the screenwriters - The A-Team's Skip Woods then rewritten by David Ayer, who also directed - take great care in setting up the story as well as the action. The mystery isn't as tightly wound as either are attempting. Certain revelations drop like a foam brick. On more than one occasion the film edits back-and-forth between timelines without our initial awareness that it's doing so. This creates little mysteries inside the bigger mystery and was much better handled in films like The Silence of the Lambs. Here, it just adds to the overall convoluted pacing the rest of Sabotage carries. While the main pieces to this puzzle don't completely fit together, the border of the thing is loaded with hammer-to-nail action impact, and all of those pieces fit perfectly. Ayer is by no means a stranger to hard-hitting action with Training Day, Dark Blue, and End of Watch as just a few of the films he's either written or directed. What he offers us in Sabotage is no less bloody or violent that anything those films gave us. More so, really. The reality of it all isn't quite up to Ayer's par, but you can't the film doesn't spin your head with some intense sequences and some grotesque aftermaths. We're talking slasher movie effects at certain times. And if we're going by slasher movie rules, Sabotage has a mighty line of faces on that poster. Besides the main man, that eclectic bunch of testosterone-filled skull-crackers is made up of Sam Worthington, Joe Manganiello, Terence Howard, Josh Holloway, Max Martini, and even Mireille Enos as the lone, female member. Don't worry, though. You get the impression the guys all fear her most of all. They're all strong here, with Manganiello and Enos respectively stealing multiple scenes. Howard, God love him, is dead-on as always, but of the crew his character is the least developed. In that he's not developed. At all. A few deleted scenes clearly had to have been left on some floor somewhere. Sabotage isn't a vehicle for Schwarzenegger, and yet he gives Wharton the perfect amount of darkness that keeps the film's protagonist ambiguous through-and-through. That's good for Schwarzenegger, who still comes off a bit rusty when he delivers dialogue. However, when it comes time for some shotgun intimidation, he's still the man for the job. 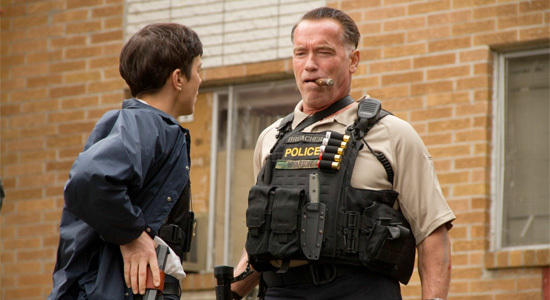 Schwarzenegger even brings some charm to the table, his strongest screen partner being Olivia Williams as the investigator who's in over her head. She, too, steals a few scenes from the big guy. Everyone gets their moment - Well, maybe not Terence Howard - and there's even plenty of time for the sets, props, and stuntmen to do a little exploding of their own now and then. As far as that aspect in Sabotage goes, the final moments of the film are its high point, a strange but cool scene that's almost acts as an action movie palate cleanser after the sloppy mystery that's come before it. It's no spoiler to say Sabotage ends with Schwarzenegger surrounded by smoke from gunfire, and there's a comfort in that. Schwarzenegger is back where he belongs. His movies will never be masterpieces of story, but they'll always be driven by some much-needed action excitement. I am really wanting to see this! Thanks for the review. // ESCAPE PLAN came out after THE LAST STAND, right? Yup. Never saw Escape Plan, but I loved The Last Stand. I wasn't the only one who noticed that. Escape Plan came out late last year, definitely after The Last Stand. I really enjoyed Escape Plan and The Last Stand was fine for a film to get Arnie back in the game. Sabotage though looks like it could be pretty damn good. Escape Plan wasn't too bad for what it was. This movie sounds OK too. the last stand I liked very much and this one I want to see but it is a dud at the box office... Can't someone explain why that is?